Visualizations let you present data so that your app's users can interpret and explore it. For example, you can show a bar chart that compares sales numbers for different regions, or a table with precise values for the same data. Good visualizations help you quickly and accurately interpret the displayed data. Visualizations are easy to add and customize. They can take the form of charts (such as bar charts, pie charts, tables, gauges, and treemaps), or custom objects created using tools in the Qlik SenseDev Hub. Interactivity, such as drill-down and filtering, is built in because Qlik Sense automatically highlights items associated with your selections. You can enhance interactivity further with functionality specific to the different visualizations. An example of a sheet with four different visualizations. What kind of data is it? Nominal, ordinal, interval, or ratio data? How do different parts of the data relate to each other? Can you organize the data in a way that makes it easy for you to create your visualizations? What do you want to communicate with your data? Are there dimensions or measures you will want to reuse in multiple visualizations? You also need to understand your data in terms of fields, dimensions, and measures. These affect how your data is used in your visualizations. Each visualization type has a specific goal. You need to think about the purpose of your visualization, and pick a visualization type that lets you explore your data for that purpose effectively. For example: You want to show how a measure, quarterly sales, behaves over time. You should create a line chart, because one of its strengths is displaying how measure values change over time. For more information, see When to use what type of visualization. You can use insight advisor to have Qlik Sense analyze your data and generate a selection of visualizations. You can then choose to add these visualizations to your sheets. 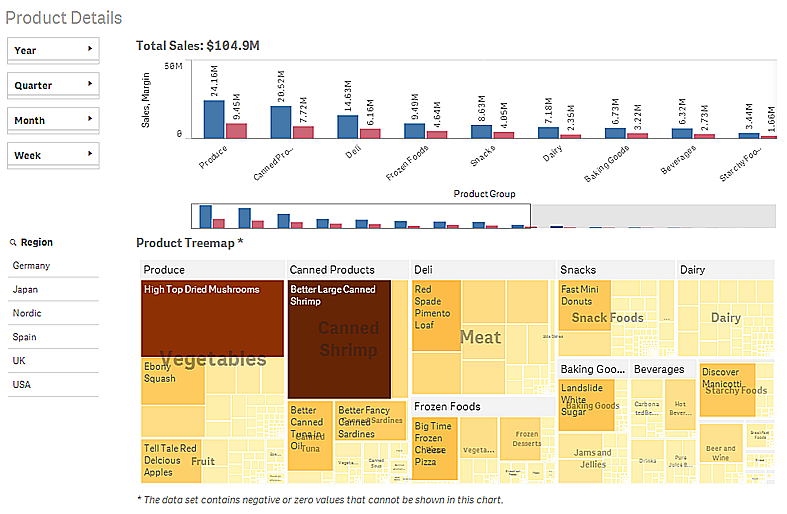 For more information, see Creating visualizations from your data using insight advisor. You can also create visualizations using chart suggestions by dragging a field onto the sheet from the assets panel and then dragging additional fields that you want in the visualization onto the first field. Qlik Sense then creates a suggested visualization based on the fields selected for the visualization. For more information, see Creating visualizations using chart suggestions. As you create your visualizations, you can modify them to improve how data is displayed and highlighted within the sheet. You can also change the data within it, or switch the visualization to another type.